Found a home on a newel post in a foyer in the South End, MA. 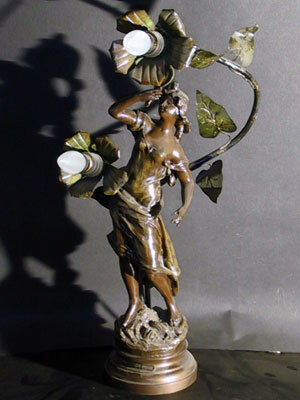 This lovely figural 2-light Art Nouveau Architectural Lamp is titled , "Premier Miroir" on the front of the base and is signed by the maker Rousseau on the back of the base. The subject matter is of a young woman looking into her first mirror. Made of white metal and brass, this at one time could have been a Newel Post Lamp and now is set up as a regular lamp with a long cord. Measures 23" tall and 14" wide with a base 5 1/2 " diameter. Circa 1915 this light will go in many of your rooms.